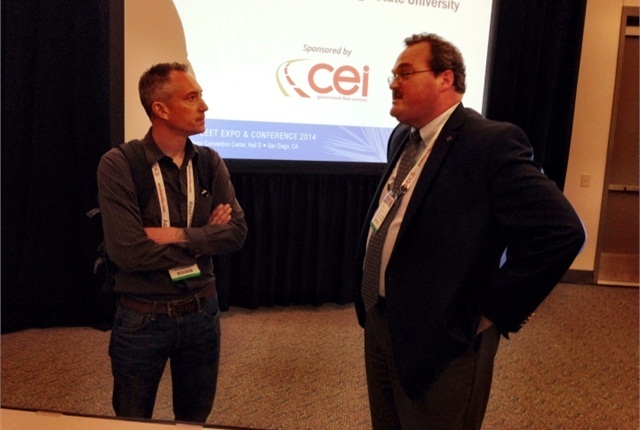 Kelly Reagan (right) speaks with a fleet manager after his CNG session. Photo by Paul Clinton. The City of Columbus, Ohio, saved $430,000 in fuel costs by using compressed natural gas vehicles, the city's fleet administrator told an audience at the Government Fleet Expo and Conference at the San Diego Convention Center. Kelly Reagan, in "Does CNG Make Sense for Your Fleet?" on June 3, said he expects to reach $2 million in annual fuel-cost savings by continuing to convert mostly heavier trucks in the public works and refuse departments to run on CNG fuel. "We're focusing on the heavy-duty assets," Reagan said. "We may also have an opportunity to convert light-duty units." Reagan manages about 6,500 units, including 750 vehicles that have been targeted for conversion to a dedicated CNG vehicle from gasoline. While Reagan said CNG has brought fuel savings, cleaner air, and a domestically-sourced fuel, adding these vehicles to a government fleet comes with its challenges. Fleets must likely also build fueling infrastructure, which can be a costly proposition. Reagan said his city's first two stations cost about $3 million and $6 million, even though he estimated they would cost $1.5 million. Reagan also said fleet managers considering CNG coversions must address several myths about the fuel and fueling stations including misguided beliefs about the safety of the fueling operation. "It's safer than petroleum," Reagan said. The session drew numerous questions and a warm applause, following his presentation. Mike Boydslun, the fleet manager of the Red River Waterway Commission in Louisiana, said he has hesitated to adopt CNG for his smaller fleet due to infrastructure costs. "I'm not commited to it just because of the size of our fleet," Boydslun said. "The fuel savings would be the main reason (to add CNG vehicles)."